Seachem Purigen Review – A replacement or a companion to activated carbon? | My Goldfish Is Alive! Seachem Purigen Review – A replacement or a companion to activated carbon? Filtration is essential in goldfish keeping due to the amount of wastes they produce. Most common off-the-shelf filters come with capability for mechanical and biological filtration, but a good filter should provide chemical filtration as well. More often than not, activated carbon is the media used for chemical filtration, but is it good enough? 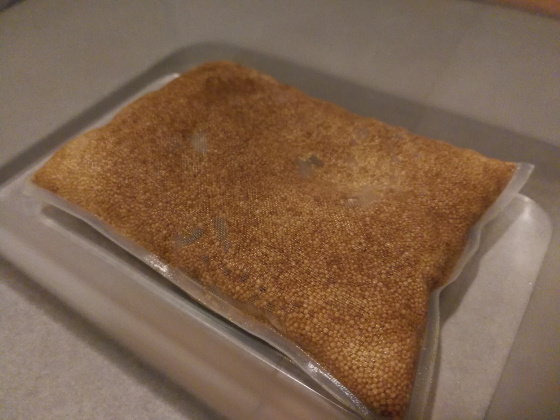 Here is my Seachem Purigen review, a look at another filtration media for that purpose. Is this a better replacement to activated carbon or more of a companion that goes hand in hand? Note: This post contains affiliate links. For more information, please visit my disclosure page. Also available in 250ml, 500ml, 1 litre, 2 litres and 4 litres that come in bottles and fine mesh bags are sold separately. 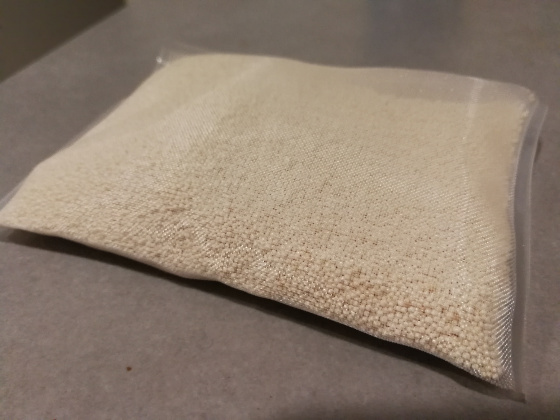 Purigen is a premium macro-porous synthetic polymer and an organic filtration resin that is able to remove soluble and insoluble impurities from your fish tank water. They are packaged and marketed in different volumes but for this Seachem Purigen review, I am basing it on Purigen 100ml which comes in a fine mesh bag. Fish wastes, decaying plants and uneaten fish food are among the few sources of organic wastes in your fish tank. Purigen acts quickly to remove these nitrogenous organic wastes before they turn into toxic compounds. This help to control the amount of Ammonia, Nitrites and Nitrates in your fish tank. Purigen is also effective in removing odors from the fish tank. If the tank water got discolored due to substance such as tannins, Purigen does a good job clearing that up as well. Purigen polishes the water, which is a process that removes microscopic particles from the water. As a result, you get a crystal clear fish tank. Sounded like some Terminator movies, eh?… well, not that kind of regeneration though. As Purigen gets into the action, it will slowly lose its “power” as it exhaust and turn darker in color to eventually dark brown. Do not throw it away as it can be regenerated for use again. Soak Purigen in a 1:1 bleach:water solution for 24 hours. Make sure to use bleach that doesn’t have anything extra such as scented or dye. After 24 hours, Purigen should turn whiter by now. If not, I would leave it to soak a little longer. Once done, remove it and rinse thoroughly with tap water. Prepare a solution with 4 teaspoons of dechlorinator (I use Seachem Prime for this) in a cup of water. Soak Purigen in this solution for at least 8 hours. After that, rinse Purigen thoroughly and it is now ready to use with your filter. So what about activated carbon? 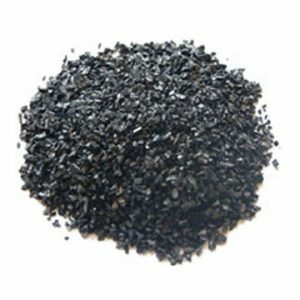 Activated carbon is a highly porous substance that works on adsorption. What this means is that it would attract organic chemicals to it and then stick and retain them on its surface. This makes it very effective in removing odors, water discoloration from driftwoods and medication from the fish tank. However this also causes it to act on trace element and micronutrients which are dietary elements required by living organisms such as plants as well. Activated carbon does not work well with inorganic compounds, so it is not effective in dealing with Ammonia, Nitrite or Nitrate. However as the beneficial nitrifying bacteria can colonize on its surface, these bacteria can provide the biological part of filtration. As activated carbon works by sticking organic chemicals to its surface, its capacity is very much depends on how large the surface area is. In our typical off-the-shelf filters, activated carbon reaches its maximum capacity very quickly and it is recommended to replace them every 2-3 weeks. There are also claims that cheaper activated carbon could leech phosphates when left in the fish tank for too long. This is not good as phosphates will cause an outbreak of algae. How does Purigen compare to activated carbon? Basically Purigen does everything you want from using activated carbon, only that it does it much better and quicker. Its unique macro-porous design is able to remove impurities from water at a rate and capacity that are much faster than other products. By removing nitrogenous wastes, Purigen helps control Ammonia, Nitrite and Nitrate in your tank; something that activated carbon does not do by itself. Purigen has minimal impact on the beneficial trace elements and micronutrients as compared to activated carbon which will remove them. In cases where you need to medicate your tank, you will need to remove activated carbon because it will dilute and reduce the efficacy of the medication. Purigen on the other hand does not affect the medication. There were claims that activated carbon could leech phosphates or other chemicals that it has adsorbed back into the water. Purigen does not leech any unwanted chemicals. When activated carbon is exhausted, you will need to throw it away and replace with new ones. With Purigen, you can regenerate it for reuse. However do note that with each regeneration, Purigen does lose some of its effectiveness. So is Purigen a replacement or a companion to activated carbon? Activated carbon is cheaper compared to Purigen. It is more economical to use activated carbon in treating large volume of water. In cases where you need to remove any traces of medication from the fish tank, activated carbon will be the best choice. What about getting them both to work for you and by sharing the load, your cheaper activated carbon will be able to help prolong your Purigen’s life cycle? Seems like a Win-Win situation, no? So as a conclusion, I think Seachem Purigen and activated carbon should be companions that go hand in hand in keeping your fish tank clean, crystal clear and safe for your goldfish. Do you agree with me? Please leave your comment in the section below. If you have any experience with other chemical filtration media, do share it as well. Thanks! 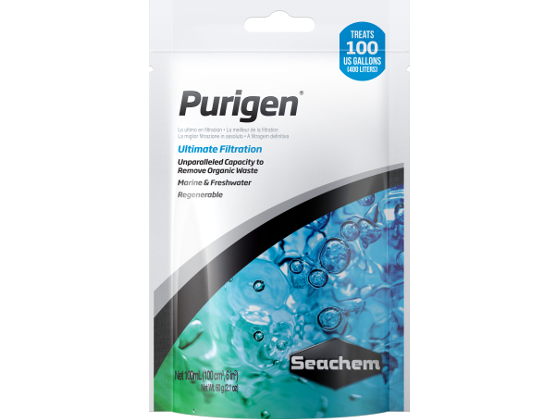 Posted in Product ReviewTagged affiliate, filters, review, seachem8 Comments on Seachem Purigen Review – A replacement or a companion to activated carbon? Good recommendation on using both Seachem Purigen and activated carbon together. I have used activated carbon before and they brought good results, will have to try out your recommendations and see. I like it that it can be regenerated so I can save a bit on the cost. Thanks for sharing. Yeah.. although I have to say that Seachem Purigen is much more effective and quicker than activated carbon, they can be used together for a better result. Let me know how you find Purigen after you have tried it. Thanks! Great article. Thank you for writing it. I had gold fish a few years ago, but I was sloppy with the maintenance and my fish died in the end. I can see how using both Seachem Purigen and Activated Carbon together would be very cost effective and help cut down my maintenance. This would lead to healthier fish who should stay alive longer – yeah!! Thanks for sharing. So sorry to hear about your goldfish. Hopefully you know better now about fish tank maintenance and goldfish care, if you ever decide to take up this hobby again. Thanks for the comment! I haven’t had fish since I was about 4 years old. I’m more of a cat and dog person these days 🙂 But wow, so informative! Thanks so much for this, because I’ve kicked around the idea of getting a fish tank – yes, I of course care about the fish, but I also think a fish tank is a nice decorative touch to a living space. Thanks for this! I’ll definitely reference it if I do make that decision in the near future! Thanks for the comment. 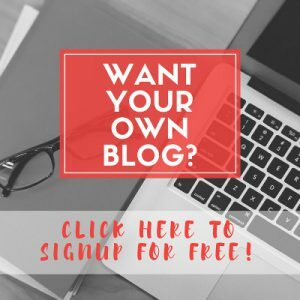 Hopefully my blog will be able to help you when you set up your fish tank. Let me know if you have any questions. All the best! How use both? Carbon filter first place (front?) and then Purigen or viceversa? I think it doesn’t matter which comes first. As long as the purigen and activated carbon get enough water flow, that should be fine. 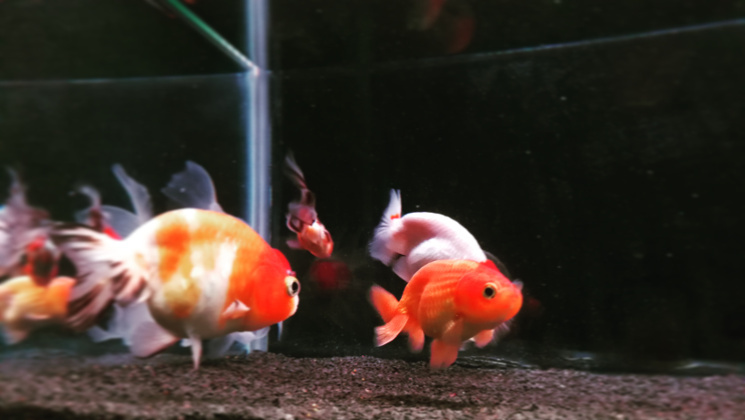 Dropsy on Goldfish – Why is my goldfish looking like a pine cone? © 2019 My Goldfish Is Alive!